Da Silva doesn’t remember much about his eldest brother, Joseildo, other than the fact that his legacy as a notorious drug dealer lives on in infamy. When da Silva was five, Joseildo was killed by police in front of his grandmother’s house. He was 21 and his corpse was rattled with one bullet for every year of his life. A few years later, his brother Lucas (then 13) began smoking and taking drugs. Lucas also got wrapped up in Joseildo’s underworld and was also killed by police at just 16. Before he died, however, Lucas had started work on a project for his community: a soccer field. For years, the kids in Penedo de Cima had nowhere to play the beautiful game. Da Silva and his friends would play soccer wherever they could find space or just stay inside, he said. 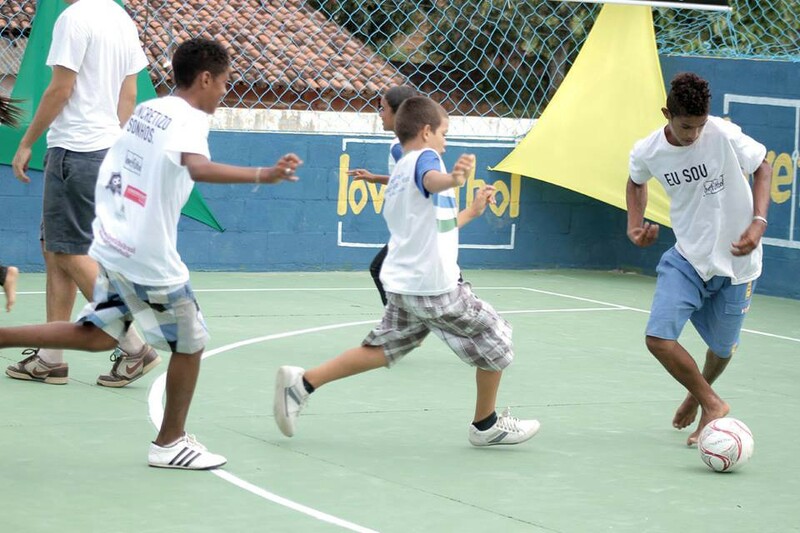 But in 2013, an organization called love.fútbol (LF) began construction on a field for the community and the da Silva brothers, Lucas and Izaque, got involved. LF is a nonprofit that builds soccer fields mostly in Latin America but has big plans to expand in 2016 to parts of Africa and the U.S. The fields are built and maintained by the local communities. The desire to play is bigger than drugs. He said that there are still drug users in the community but when they come to the field, it’s to play as opposed to dealing. “The desire to play is bigger than drugs,” he said. Da Silva has new goals now. He wants to follow his brother Jeferson’s footsteps and become a sailor. And he seems to be on the right path. He likes studying history and geography in school. He’s now playing in a soccer school called Jogado do Futuro — a program founded in October 2015 on the field built by LF. He said soccer keeps him focused, “pumps me up and makes me happy.” He cheers for Sport Recife, Spanish club Barcelona, their rivals Real Madrid, and French champions Paris Saint-Germain. He models his play after fellow Brazilian David Luiz, because he also likes playing defense, he said. But life in communities like Penedo de Cima isn’t easy for young people like da Silva. Youth in his area don’t have many career prospects. It is not uncommon to see youth in da Silva’s community end up as street vendors. According to a poverty analysis by the World Bank, poverty takes more of a toll on Brazilian youth than other demographics. Brazil’s child labor rate is at least twice as high as any other Latin American country. Recent years have also seen Brazilians protest rising bus and subway fares, and government corruption. Today, a political scandal whereby President Dilma Rousseff named former President Luiz Inácio ‘Lula’ da Silva her chief of staff to avoid corruption charges, is infuriating Brazilians. Among the most substantial problems in the country though is the rampant levels of police brutality. Brazil’s police force has killed the same number of people in the last five years as American police have in the last 30. Among those figures are da Silva’s brothers. Police have also been accused of racism and classism while targeting poor youths in favelas.